Marina Endicott was born in Golden, BC, and grew up in Nova Scotia and Toronto. She worked as an actor and director before moving to England, where she began to write fiction. In 1984 she went west to Saskatoon, where she ran the Saskatchewan Playwrights Centre for many years before going farther west. She edited the weekly paper in Mayerthorpe, Alberta, was Associate Dramaturge at the Playwrights Colony of the Banff Centre for five years, and created the writing and readings program at the Cochrane Library. Her debut novel Open Arms was a finalist for the Amazon/Books In Canada First Novel award and serialized on CBC Radio's Between the Covers. 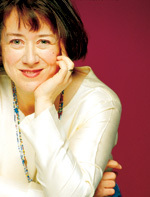 Her stories have been widely anthologized and short-listed for both the Journey Prize and the Western Magazine Awards. She's had three plays produced and her long poem, The Policeman's Wife, some letters, was short-listed for the national CBC Literary Awards in 2007. Marina Endicott's second novel, Good to a Fault, won the Commonwealth Writers' Prize Best Book Award - Canada and the Caribbean, was a finalist for the Scotiabank Giller Prize, was a CBC Canada Reads 2010 pick, and was named one of The Globe and Mail's Top 100 Books of 2008. She lives in Edmonton.